Yesterday my brother asked to get this instant smoothie mix, Vega Whole Food Smoothie Infusion. It’s all natural, made with plant-based ingredients and “rich in organic, raw superfoods”. We got three of the small packets and this morning he had a smoothie with it. Once it was made, he asked me to take some photos of his smoothie before drinking – with the purpose of sharing it here. Was he ever patient! This is my first drink recipe here, and also my first time photographing drinks. I think I did pretty well for my first time. These last two shots were directed by my brother. The Bionicle and “thumb’s up” ideas were his. Thinking up a name for this drink took some creativity, too. (“Green Banana Smoothie…hm, no – it’ll make people think of green bananas.”) Then it struck me – what about Emerald City Banana Smoothie? Although my brother hasn’t watched or read the book The Wizard of Oz, he is familiar with the story. 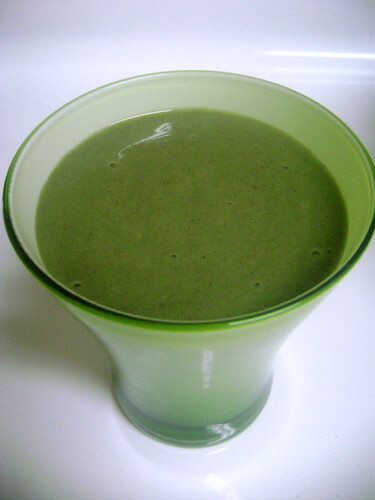 The name, however, was tweaked slightly at his instance: Emerald Green Banana Smoothie. yellow pea protein, organic hemp protein, organic sprouted flax seeds, organic brown rice protein, organic green food blend (spirulina, organic wheat grass, organic alfalfa grass, organic barley grass, organic spinach, organic sprouted broccoli, organic kale, organic kelp, organic dulse), inulin (from chicory root) , natural flavors, xanthum gum. Normally I wouldn’t post a recipe that requires a special mix or blend, but, like I said, my brother asked me to put this recipe here so this is all out of sisterly love. It can easily be made without the smoothie mix, only it won’t be green anymore. Break the bananas in chunks and put in a tall container, such as a glass measuring cup. Add the strawberry jam and pour in the rice and soy milk blend until it just about covers the fruit, about three quarters. Sprinkle in the smoothie mix and blend with an electric hand blender until smooth. Or, blend the fruit and milk, then add the smoothie mix and blend again until smooth. Pour in a glass and enjoy! This may also be done in a blender or food processor. I have never bought packages to make smoothies, is there any taste difference? Grainy or otherwise? Just curious! Thanks!! Ah, yes! 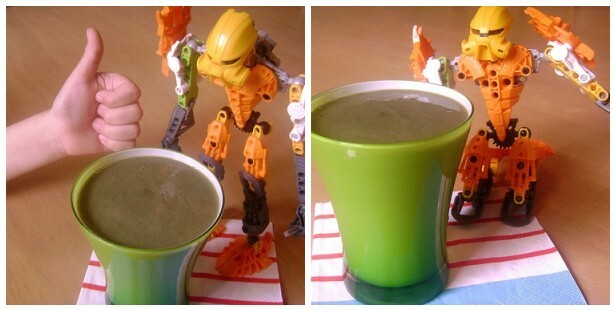 Well, folks, you can call this green drink whatever pop culture-reference you like! Haha. This powder does work out well; it’s not lumpy or grainy, or any nasty stuff like that. If it was, I’m pretty sure he wouldn’t have wanted me to post it, much less drink it! 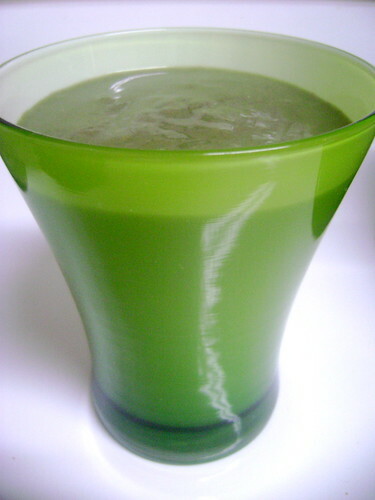 The powder isn’t necessary to make this drink, unless you want the green colour – but I’m pretty sure other green food could work. Apparently avocado is pretty good in smoothies and shakes, though I’ve yet to try one made with the green fruit.